It is such a joy to hear you talk about Yes like you do. I’m not even sure I can describe it but however you do it please don’t stop! I remember playing Long Distance Runaround and my younger brother Gary who was just learning how to play bass well if you can imagine playing that over and over until he got it perfect well all I can tell you is he did in some years ago was able to meet Mr. Squire and said he was like oh my it’s Chris and Chris said why yes it is and my brother in his famous words told Mr.Squire that his first wife left him because he had bought a bass and all he said was that Chris said sorry to hear that and laughed and walked away.Another thing that this album produce for me was that my Father was a according player and a piano player and a organ player anything with key’s he was into when we would play that solo from Rick my Father would ask me who is that guy ? I know that he did not want to admit it but he liked his style a lot! So of course today I regret that I never stuck with the guitar because Steve Howe was my hero growing up and my Brother Gary had Chris as his idol so you can imagine what it was like in our house in the mid to late 70’s it was all Yes except for my brother learning some other bass licks from Zeppelin and Alice Copper.Back when I was starting to listen to Yes it was a music seine that was just full of 3 min. songs well thanks To Yes that all changed for me and I can say that it had a profound presence in my life to this very day! as always Kevin keep up the great work can’t wait for next week! It’s great to hear about the variety of music you grew up with and the talent in your family! I have managed to get my older son to listen to some Yes but he’s the only convert so far…I’m still trying though! I’m always jealous to hear of people who have met my heroes – one day, I’ll be there with the guys from the band – and I won’t forget my microphone! 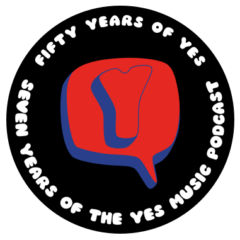 Keep listening to Yes and to the podcast and thanks again. 1) I loved Rick’s solo piece when I was a teenager in the mid-1970s. Rick’s playing was extremely influential among 1970s rock musicians. But unlike most of the rest of Yessongs, Rick’s solo does not stand the test of time with me, and wore itself out after repeated plays a long time ago. Rick’s solo is the low point of Yessongs, and I think it is only important as a historical piece of early keyboard technology. Fun Fact. The short melody that Jon hums before Rick’s solo is the opening bassoon melody from another Stravinsky ballet – The Rite of Spring. 2) Bruford vs White – Yessongs was the second Yessongs album I ever heard, right after Close to the Edge. At first listen, I loved Alan’s energy and did not have the patience for Bill’s subtlety. My opinion on this has reversed over the years. 3) I have no idea what Steve is doing, but Long Distance Runaround from Yessongs is far superior to the Fragile version. It is less polished, but the twangy, loud, clanky, crunchy tone that Chris dredges from his bass during this song is unequaled. I have never heard a bass that high up in the mix without drowning out all other instruments. The loud yet trebly tone is the perfect mix on this song. Hi Joe and thanks so much for the comment. That’s a fascinating take on Rick’s solo – as you can tell from the episode I agree with you that it really doesn’t sound great now, despite the brilliance of some of the playing. Thanks for the note about Jon’s opening melody as well – I will need to go and find that one! Bill and Alan both have superb but very different techniques, don’t they? White has secured the seat over many years and is equally happy in any of Yes’ many styles. I also love Bill’s playing but I can’t see him agreeing to play songs from 90125, Talk, Open Your Eyes or Fly From Here, for example. Neither do I think his style would be appropriate. I couldn’t agree more about our hero, Chris. He really is unique and irreplaceable. Long live Chris, keeper of the flame. The Firebird Suite/Siberian Khatru opening sounded right off of Yessongs! What a thrill for a youngster who was licking his chops to hear his heroes play an iconic cut off of his favorite album! They went straight into Tales material for a long stretch after that, which was a tad bewildering and long winded, to be perfectly honest—but it did pay off: The Ritual was flat out amazing, and it rightfully became a staple of Yes shows for many years to come. A couple of other songs were played very much in the style we hear on Yessongs: And You And I had Steve playing the intro on his hollow-body Gibson electric, then sitting down to play pedal steel on the big middle section, Roundabout was the power-rock arrangement you hear on Yessongs to close out the set, and the encore of Starship Trooper sounded much like it does on the triple-album tour de force we all know and love. The best thing about Yessongs for me, then and now, is Steve Howe just going nuts everywhere. Heart of the Sunrise—just on fire! Roundabout, where he throws those speed licks into the final chorus. And so on, across six sides of vinyl. Two things, IMO, transformed Yes from thoughtful prog-rock studio guys into Live Arena Rock Monsters: Alan White’s power drumming (and the way Chris modified his style as a response), and Steve just bringing it with rock-god guitar playing. He’s dialed it back in more recent years (hey, he’s still Steve Howe! ), but in those days he absolutely was the big-dog instrumentalist in Yes when they played live. The other guys took their turns, but it was Steve who always stepped out the biggest. That’s how I remember the shows anyway. I don’t remember Rick doing a keyboard solo in that first show. The Six Wives album was a pretty big hit the previous year (it’s terrific, BTW, the best of the Wakeman solo efforts from that era, you should do an episode on it!) and you would even hear cuts on the FM stations in LA, usually at night when the DJs (Back in those days they had real DJs!) had more freedom to stretch out, go into deep cuts and interesting and unusual stuff. But again, I digress a bit. I agree with you wholeheartedy: I also don’t much care for classical music being played on rock instruments. It’s a noble idea to try to bring masters like Aaron Copland to rock audiences, but in practice it is ponderous and not all that interesting. Like you, I far prefer, say, Leonard Bernstein and the New York Phil playing “Hoedown” or “Fanfare for the Common Man” to ELP’s treatment of those marvelous pieces. Bruford v. White. Almost afraid to wade into this one. They are both terrific drummers, obviously. And night-and-day different stylistically. That’s the obvious take on it. Me, I prefer White. I like rock drummers who snap out the backbeat and play big. (To be fair, I never did get to see Bill play with Yes, only with King Crimson on the Discipline tour.) I do have to say that the studio version of Heart Of The Sunrise is Bill’s song, especially that second section where Chris steps out with the bass and Bruford just hits those perfect, beautiful jazz accents behind him. White’s drumming on the Yessongs version of HOTS is competent and powerful, but the studio version had the touch of real genius to it. Nobody did stuff like that on rock records then–or now for that matter! It’s also noteworthy that White was doing the “earn while you learn” thing on the Yessongs tour: he joined the band only weeks before they hit the road. A few weeks to learn Yes material! On a lot of tunes, like And You And I, he got a lot better at it in later years. I know because I saw and heard the development. Your take on Long Distance Runaround and The Fish was really interesting to me. I was kind of dismissive of those tracks, always had been. I mean hey, if it’s Yes, I like it, but those were not up there with their best in my not-so-humble opinion. I went back to those cuts with some “fresh ears” and found that I largely agreed with you…a diamond in the rough that I had overlooked for a long time! You see how you did that Kevin? LOL. Anyway, gone on for way too long again, but I do want to close by thanking you again for the dedication and work you put into this, and I hope this online Yes community you’re building continues to grow and prosper! Wow Richard – thanks so much for taking the time to leave this amazing comment! It must have been amazing and mind-blowing to see the band in the 70s like you did – I was, sadly, far too young. I can imagine the sense of bewilderment you mention at hearing Tales for the first time – even on record I needed to listen numerous times to appreciate what was going on! Steve Howe does indeed star on this record and it’s interesting to note that he almost approaches Peter Bank’s level of live excess but always manages to keep in the true spirit of each track whereas I think Banks sounds like he is playing in a different plane of existence to the rest of the band at times, live. I saw Leonard Bernstein in London during his 70th Birthday celebrations and Copland is my favourite composer so yes, I agree with you there! Fascinating to hear you witnessed Alan White’s development as a component of Yes. I think we often forget that these guys are, contrary to appearances sometimes, human. We all develop and change, which is why I’m sometimes a bit sad when I hear fans complaining about the current line up or how fast they take some of the songs. Certainly, White did and does an amazing job and it’s difficult to see anyone – even Bill – taking his place. Good to hear you took another listen to The Fish – it’s always good to listen again to tracks, I find, especially after a long time away – it’s one of the things I have enjoyed most about doing the podcast. So thanks once again and please do keep listening! Thanks Kevin. Like I said, as a teenager and young adult, Yes were the big kids on my musical block. Love that you are a fan of Aaron Copland, and Bernstein had a special knack for bringing magic to Copland pieces. I saw the LA Phil play a Copland program a few years back, I liked it, but the recording I have of Appalachian Spring with Bernstein and the NY Phil will always be the definitive version for me. I played Appalachian Spring, Rodeo and the Organ Concerto (though not the organ part!) a few years ago and loved it all. I also like the so called ‘difficult style’ pieces like the Nonet for Strings and Music for the Theatre. All great stuff! I’m surprised no-one has mentioned the terrible production of this album. Such a shame. What was Offord thinking? Or am I the only one who thinks this? It’s on my ‘to-do’ list so thanks for the tips! I will indeed let you know how I get on.